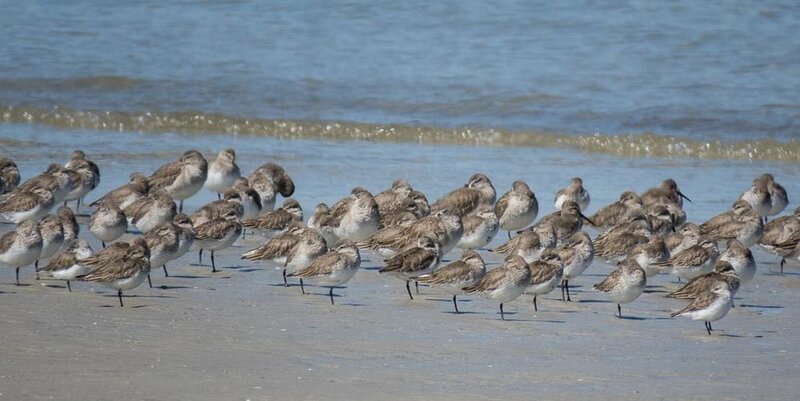 Georgia’s Barrier Islands have been designated as a Landscape of Hemispheric Importance by the Western Hemisphere Shorebird Reserve Network (WHSRN)! Georgia’s Barrier Islands become the WHSRN’s 100th site! This is great news for the Georgia Coast and Ogeechee Audubon was pleased to help get the word out about this designation. The Georgia Barrier Islands WHSRN Landscape was designated due to its supporting more than 30% of the bio-geographic population of rufa Red Knot and the Great Lakes breeding population of Piping Plover. Based on a band re-sighting study, the stopover population of rufa Red Knot on southward migration has been estimated at 23,400 birds, while up to 13,775 birds have been documented using the area during northbound migration. The area also holds more than 10% of the bio-geographic populations of American Oystercatcher, Short-billed Dowitcher, and Black-bellied Plover. Other noteworthy attributes include one of the largest spring gatherings of Whimbrel in North America, and impressive numbers of wintering shorebirds of many species. Please CLICK HERE to read the full press release and get more information.